ABOUT US – Glenn Richardson Plumbing & Heating Ltd. The plumbing trade has been in the Richardson family for a number of years and many generations. Glenn Richardson Plumbing & Heating Ltd originally started as Stu Richardson Plumbing Repairs in 1951 by Stu Richardson. The business truly became a family business when Stu’s son Glenn Richardson started working for the company in 1953. Glenn later bought into the business in 1965 and it became Stu Richardson & Son Plumbing Repairs. In 1970 Glenn Richardson broke out along with his wife, June Richardson to start Glenn Richardson Plumbing. They worked hard over the next 5 years to build a strong, profitable company and when Stu Richardson decided to retire in 1975 they were able to combine both companies and create Glenn Richardson Plumbing & Heating Ltd as it is today. As a young boy Rod Richardson started working with his father, Glenn, and his grandfather, Stu, on Saturday mornings but officially beginning his career in the family business in 1977 when he started his apprenticeship right out of high school. Rod worked hard to continue learning the trade and the business side over the years and bought into the company in 1988. In 2003 Glenn began to work part time and Rod fully took over the business. In 2004 Rod’s wife Carol Ann joined the business full time by stepping into the role of Office Manager after a number of years of helping out in the office on occasion. Glenn fully retired in 2007 after over 50 years in the business. Rod was fortunate to have his father around for those four years to continue giving him advice and guidance as he transitioned into his new role. 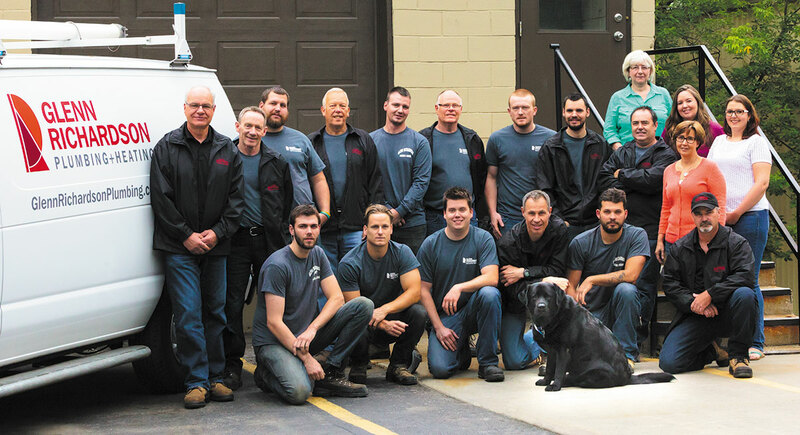 Glenn Richardson Plumbing & Heating has a long family history and the Richardson family looks forward to writing more of that history as the fourth generation begins their careers in the company. Rod and the rest of the family hope that you, their loyal customers will continue to help them write that history as well with your continued support. As the third generation in a plumbing family I started young in the family business. I began helping my father and grandfather as a young boy on Saturday mornings, all week I would look forward to those Saturday mornings and working alongside. Many years later when I took over the family business I took forward the two most important lessons my grandfather and father had taught me time and again over the years; if you do a good job at a fair price and look after people you will never go wrong. Glenn Richardson Plumbing & Heating Ltd has been around for over 60 years and I truly believe it is because we understand it’s the relationship we forge that ultimately builds lasting partnerships both with our employees and our customers. We continue to work timelessly to build that confidence with new customers and maintain that confidence with long time customers. Just as I did, the fourth generation, my sons Kyle and Matthew began helping out at a young age. As they continue to learn the business and the lessons that I learned from my father and grandfather, I look forward to the future and what it might bring. We look forward to working with you and building the confidence that has kept us in business for over 60 years.